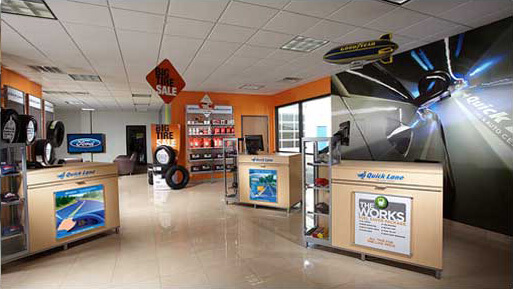 Quick Lane® Tire & Auto Center in Porter is one of the largest of its kind in the nation. We offer 28 state-of-the-art service bays to get your vehicle in fast and back on the road quick. Proud to serve the greater Houston, Aldine, The Woodlands, Conroe and surrounding areas; we provide all the services your car, truck or SUV needs most. All automotive services are performed by factory-trained experts who work on your schedule. You'll never need an appointment, and you can get service while you wait – even on evenings and weekends. At Quick Lane, we strive to make your service experience an enjoyable and speedy one. Everything, down to our service area, has been designed to fit you and your vehicle's needs. Quick Lane can service any make or model, using quality parts from trusted brands like Motorcraft® and name-brand tires from Goodyear, Continental, Michelin and more. Give us a try and you'll see why life is better in the Quick Lane. Or watch our progress on your vehicle from the interior window to the shop.